Silver is about 1/75th the price of gold by mass (as of October 2008). Over the last 100 years the price of silver and the gold/silver price ratio have fluctuated greatly. The cost of creating silver ornaments (making charges) is much lower than making charge of gold ornaments and also the silver section offers a much larger variety in terms of designs. Jewellery designers all over the globe have been creating fantastic verities of silver jewellery that are now catching more attention of the masses. 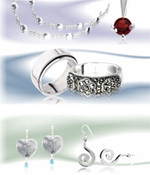 The workmanship and finesse of silver jewellery also matches or increases its gold and platinum competitors. Silver alloy like Sterling silver is contains 92.5% of silver and 7.5% of copper. Britannia silver is used for making jewellery and tends to be tableware. It contains 95.84% of pure silver and remaining 4.16% of copper. Mexican Silver usually contains 95% of pure silver and 5% of copper. Due to price advantage, advancement of technology and craftsmanship, the demand of silver Jewelry has been considerably increased. The disadvantage in purchasing silver jewelry is, it requires more care as silver has a tendency, after a long time, to darken and tarnish. This can be prevented or removed by keeping silver jewelry polished and cleaned with baking soda and hot water. Also silver ornaments are not easy to resell comparing to gold ornaments.